In stock now for just £199.99 including VAT! Hurry while stocks last! The Hudson Reed LQ362 Lucio Infinity LED Mirror has elegance, glamour and the latest in technology. This LED mirror when lit looks like it goes on for ever. The Lucio has a stunning design and is manufactured to the highest standards Hudson Reed Mirrors bring modern design and contemporary good looks to your bathroom. Hudson Reed Bathroom Mirrors are all IP44 rated that means they are suitable for Zone 2 & 3 and can be fitted anywhere within 0.6 metres of a basin or similar water source. 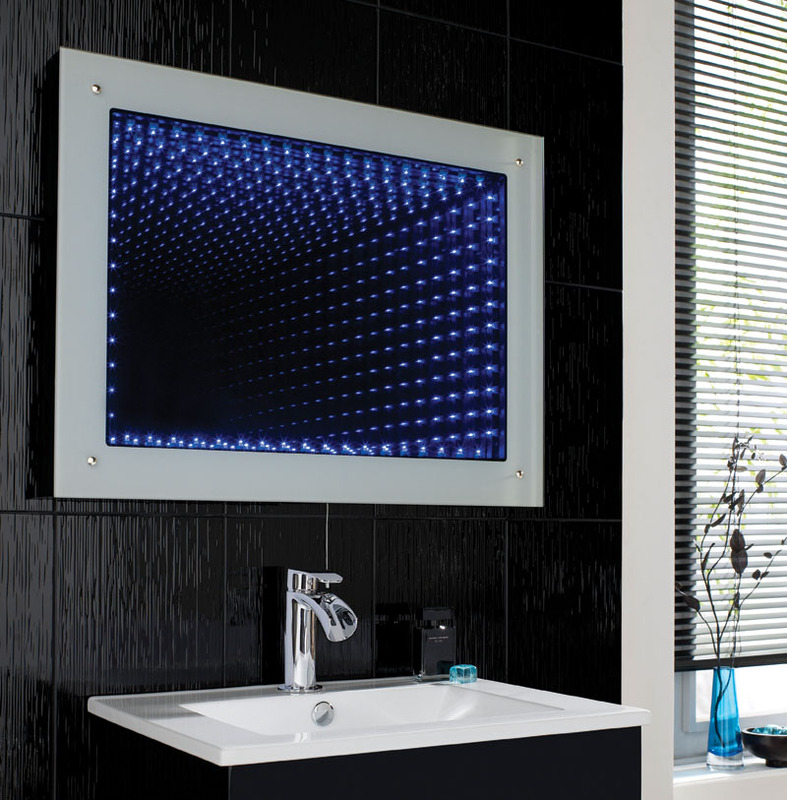 An eye-catching focal point for your bathroom with its spectacular LED lighting effect. The Hudson Reed Lucio LED Illuminated Mirror is part of the Hudson Reed range of mirrors. It offers an amazing 3D effect when switched on which will be a talking point in any room. 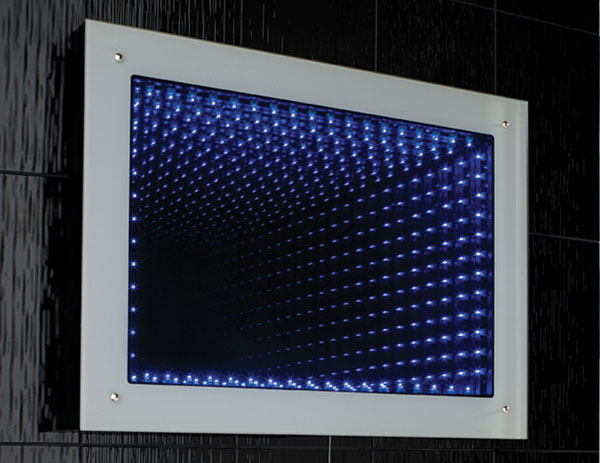 This spectacular LED Mirror is backlit with LEDs to create an optical illusion that makes it look like the mirror carries on all the way back into infinity. It is a great effect and will create a worthy centre piece for your bathroom. When not illuminated the item has a standard mirror finish accentuated by a matt silver-effect frame. 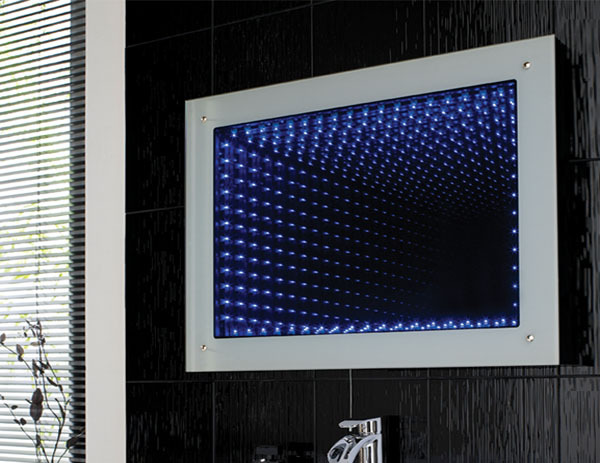 This stunning mirror is IP44 rated which means it is splashproof and suitable for Zones 2 and 3 (they can be fitted wherever the fitting may be splashed, anywhere within 0.6 metres of a basin or similar water source). The mirror is manufactured by Ultra Finishing who offer the latest designs at affordable prices without compromising on quality, through its Hudson Reed and Ultra brands. The mirror measures 600 (h) x 800mm (w) and is accompanied by a superb 12 month guarantee as standard, which is a testament to the outstanding quality of this item. One of the most visually stunning modern mirrors available anywhere today, this gorgeous designer item is available from VIP Bathrooms at an extremely competitive price. With its IP44 rating and a 12 month guarantee as standard, you also get unbeatable peace of mind.